The Korean Central Broadcasting Station (KCBS) (Korean: ????? ?, Chinese: ????? ?, Japanese: ??????) is the main domestic radio network in the DPRK. It sits under the Central Broadcasting Committee of the DPRK (called the Radio and Television Committee of the DPRK until 2009). It is also relayed at certain times via the Voice of Korea, the DPRK’s international shortwave service. All programming is in Korean and includes music, talk and news. Main news bulletins are broadcast at 6am, 7am, 10am, midday, 3pm, 5pm, 8pm, 9pm and 10pm. The powerful Haeju transmitter puts out a signal that easily reaches into South Korea, China and Japan during the nighttime. The South Korean government jams most of the North Korean mediumwave programming, but the jamming signal is weaker than that coming from North Korea so doesn’t affect listening outside of South Korea. If you’re in the region, the 500kW (kilowatt) and 250kW transmitters are also worth listening out for during the nighttime. They stronger channels can be heard on most mediumwave radios and car radios. Frequencies in italics have not been monitored or reported recently and may be off the air. The shortwave channels don’t appear to be jammed by South Korea and the 2850kHz signal from Pyongyang can be received in Seoul quite clearly all day. The power of the various transmitters varies so some are easy to hear while others present more of a challenge. 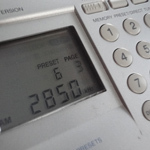 In Tokyo, the 2850kHz and 6100kHz are easy to hear in the evening. The 6100kHz channel carries Voice of Korea overseas programming between 3:30pm and 10:30pm. KCBS is also reported to broadcast on 93.8 FM in Pyongyang and 102.3 FM in Kaesong. KCBS is reported to be carried alongside Korean Central Television on the Thaicom-5 satellite. Here’s a clip of the sign-on at 5am each morning. The tuning signal plays twice then a male voice announces the name of the station, “Chos?n Chungang Pangsong imnida,” then two more rounds of the interval signal and the station name from a female voice. Then follows the time signal and the national anthem. The Voice of Korea external service uses the same format, albeit with announcements in different languages. It’s origins can be traced back to 1936 and radio station JBBK. Operated by the occupying Japanese forces, JBBK broadcast a first and second program as part of Japan’s radio network that covered the Korean peninsula from Seoul. Program one broadcast on 820kHz and program two on 1090kHz. The start dates are given as either April 10/11th or November 15th depending on the source. The 820kHz channel is still in use in Pyongyang today, albeit on 819kHz. The frequency was slightly shifted when Asia mediumwave broadcasting moved from 10kHz to 9kHz spacing between channels. Sources: Author’s monitoring, World Radio TV Handbook, Asia Broadcasting Institute, Lyngsat and Oka Lab. 2 Comments on "Korean Central Broadcasting Station"
Receiving KCBS this morning in Asheville, NC on 15180. June 16, 2014.
receiving KCBS on 720 khz now at 2030 UTC, Sep 8 2015 (0500 your time, Sep. 9). Please listen to this recording. I would be grateful for a verification.